In July of 2010, the historic Senator Theatre in Baltimore closed down. As a final farewell, they held a free screening of a super-rare Technicolor print from 1977 that was privately owned. Here are video, screen stills and other information from this rare and unlikely event. Contains information on the original theatrical audio (stereo, 70mm six-track, mono), as well as links to full files: 70mm theatrical audio recording bootleg from 1977, 70mm six-track recreation, and the mono preservation project. 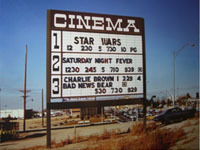 A collection of personal photographs taken from a movie theatre in 1977. Useful for some detail and rough color references. There are also scans of some private prints and examples from the 70mm cell collections. A look at how films are preserved, what materials they work from--and what is available to Star Wars. A survey of the best and most popular fan preservations of the original versions of the Star Wars trilogy on DVD and Blu-Ray. A comprehensive list of all the audio and visual changes to the films from 1997 and 2004, with comparison images. See how different the films really are. A collection of quotes in which Lucas expresses the importance of preserving films as they were and respecting our shared cultural heritage. Information on the various commercial 8mm releases of the trilogy, collectors market 16mm and 35mm prints, as well as fan telecine preservations. A list of contact information for media that is supporting our cause or could be, as well as information on Lucasfilm contacts to direct your inquiries and protests.